did a commission piece for way back when that had an awesome alter ego concept. it allowed me to do something i'd wanted to for a long time, mixing iron man and eva tech. never quite felt like i hit it, always wanted to give it another go. significantly better this time around, if you ask me. pose snatched from the same post-it session as the skull tummy iron man redesign. HAHA >w< very cheeky! this is bloody great. I agree with Jin, you just made best iron man suit I ever seen. angels are so cool, gotta love organic robots... who needs a digestive tract when you can just plug in and go? 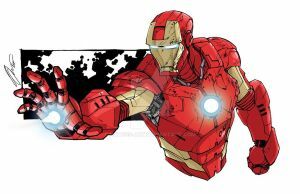 Wicked Iron Man design. I dig it. This is really well done! keep up the good work! Really awesome mix! very nice! this is TOO sick! Yo, capcom needs to get together with Gainax and make this happen. Awesome concept man, perfect execution. Forgot if I commented on this one already. Man, I love it so much. Sooooo much. Marvel make a toy and I'll buy 12.
excellent design - marvel should use this! VERY nice idea to combine that. Props. That's really cool, I'd love to see more marvel characters in this style !! Really awesome! If IM pr any other book had mech like this in it, I would be all over it! Awesome dude! Great job on the colors as well! interesting concept! loved the sketch! I had this exact idea, though it never quite came out the way I wanted it to look. Regardless excellent work!